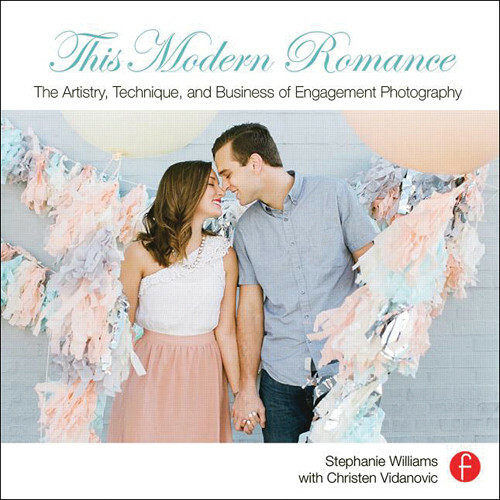 This Modern Romance: The Artistry, Technique, and Business of Engagement Photography written by Stephanie Williams & Christen Vidanovic and published by Focal Press covers how to get started and excel in an engagement photography business. The 198 page book was published in November 2013 and details the approach photographers should take when booking sessions, building your brand, technical skills, and more. The book features tips and testimonials from professionals in the industry as well as clients and has inspirational images. Stephanie Williams is a professional photographer and has her own blog, This Modern Romance. She has been featured on the cover of Pacific Weddings, Destination Weddings and Honeymoons, Destination I Do, California Wedding Day, and Australia's White magazine as well as in the pages of The Knot, Bridges, Oui, and Southern Weddings. Williams has also been on numerous blogs and internet publications like Style Me Pretty, Green Wedding Shoes, and more. She was listed as one of the top 20 destination wedding photographer in the work by Destination Weddings and Honeymoons and in 2011 she was honored as one of PDN's Rising Stars in Wedding Photography. She resides in Orange County, California. Christen Vidanovic is an Oahu-based photographer with a journalism background who specializes in weddings, fashion, and editorial photography. She can be seen in various local and worldwide publications like SMART, FreeSurf, Pacific Edge, The Honolulu Weekly, and Jetstar in addition to the photo collections of many Honolulu fashion designers.